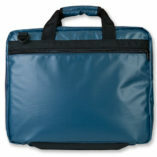 Looking for a really innovative Infection Resistant Nurses Bag? 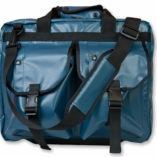 I invite you to take a serious look at our Nurses Bag design. 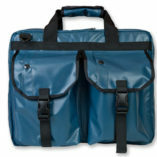 The creation of this bag was almost like planning a three step military mission! First, we located “on the job” experienced Home Health Care Nurses and asked them exactly what they wanted. Second, we found precisely the best materials to use to prevent infection and finally, we seriously explored functionality options. This whole process took a year to complete and now I can confidently say that you’re looking at the world’s most practical and innovative Nurses Bag! Priority Number ONE – Infection Control! 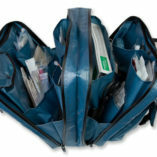 Our InfectionControl Nurses Bag has been designed, from the ground up, with Infection Control Properties being our top priority. All materials were chosen based on their ability to deter contamination and their ease of cleaning. 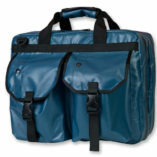 Every design decision on our Nurses Bag was first considered for its infection control benefits and then second for functionality. 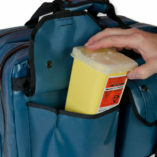 This was done in response to Home Health Departments dealing with increased costs associated with contamination of bags not designed to inhibit infection – a growing concern for Home Health Nurses who service clients in areas with a high risk of Bed Bugs. 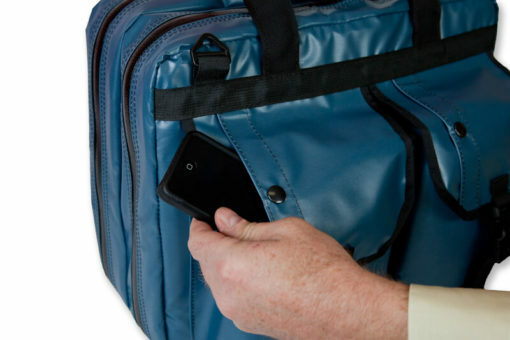 You’ll notice that our Nurses Bag has a slick, shiny surface and a flat, waterproof zipper. 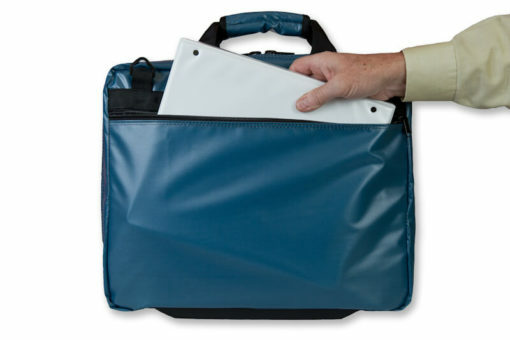 This specialty, waterproof, Medical Grade Fabric was chosen for it’s super smooth surface that’s easy to clean. With little effort, the Home Health Nurse can decontaminate the bag, with peroxide type wipes, after each visit to a client. Canvas and textured nylons are very difficult to wipe down as the fabric either absorbs fluid or create friction against the wipe and end up “holding” dirt, contaminants and even bed bugs. 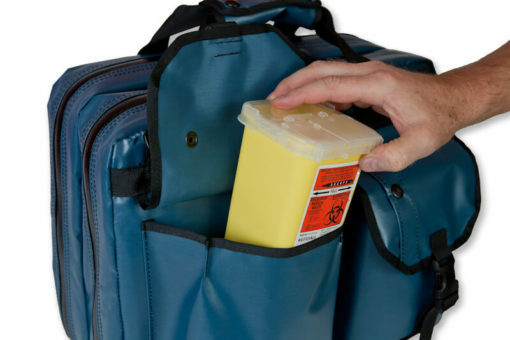 When wiping down our Infection Control Nurses Bag, you’ll notice how slippery the surface is and you’ll actually be able see the alcohol fluid being left behind on the surface before evaporating. 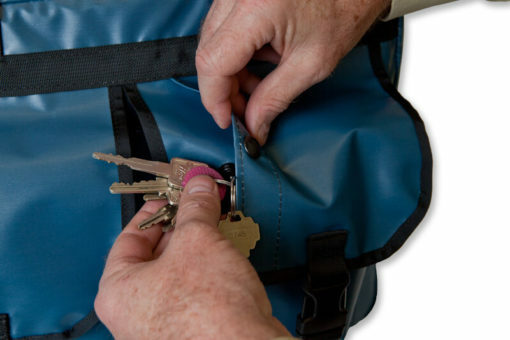 Our unique, waterproof zipper has a flat profile which prevents dirt and contaminants from getting lodged into the “zipper teeth” and it is also easy to wipe clean. 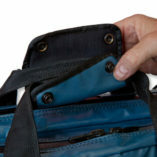 We have purposely omitted Velcro and Elastic from the Modular Bag as they are hard to clean and could hold contaminants. 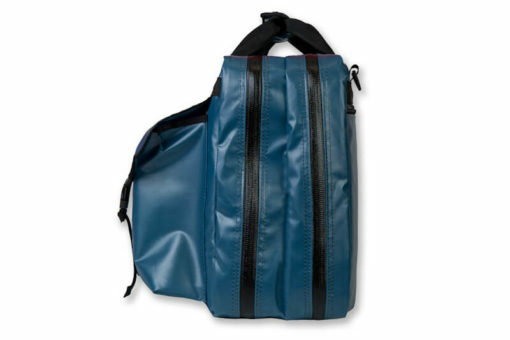 This design also enables for easy cleaning of the interior – just unzip all the zippers and the bag will open wide for easy visual inspection and cleaning of the bag – no dark pocket crevices for bed bugs to hide in! 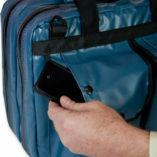 To protect the bag further, we’ve screwed high-quality plastic feet into the bottom which creates a large 3/4″ space between the bag and the ground surface. 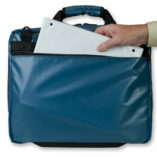 For bag cleaning: use Peroxide type wipes to clean bag surfaces after completing a visit. We strongly recommend not washing this bag in a washing machine. Priority Number TWO – Functionality! After the infection control benefits were incorporated into the design we then took a serious look at functionality. What we found was that Home Health Nurses all had different needs. During our round table sessions, we were unable to arrive at a consensus, the Nurses all required different types of pocket setups. Sometimes even the same Nurse required different setups depending on the client they were visiting that day. 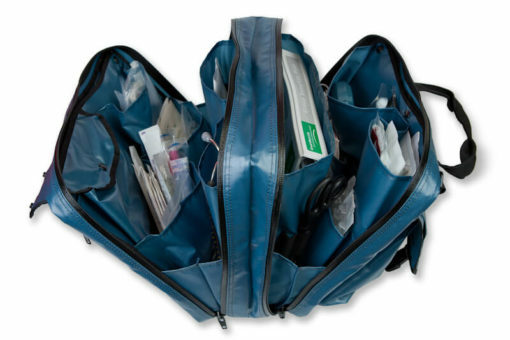 Some needed lots of pockets to hold small items, needles, vacutainers, bandages etc. and others like OT’s required big pockets that would hold large pads, splints, bottles etc. 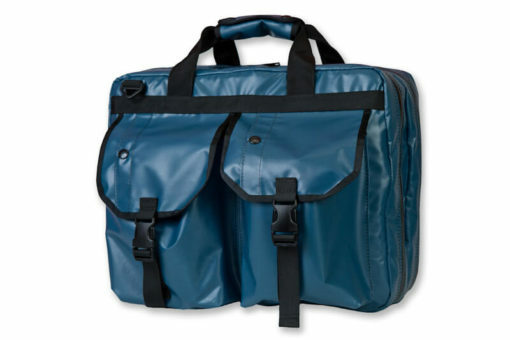 The Solution…make the Nurses Bag with a variety of internal and external pocket sizes in a zippered closed two compartment design. 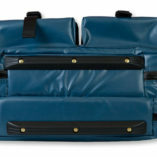 First, we created a super strong, padded and lightweight bag with 2 large, completely separate compartment areas. 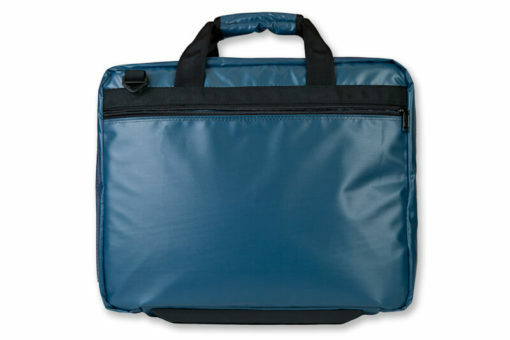 On the outside of the Nurses Bag are 2 large, expandable pouches that will hold items such a Sharp’s Containers, Blood Cuffs etc, On the back side you’ll find a flat pocket designed to hold your client charts, paperwork or small tablet device. Note: Since there are two main compartment areas, one can be designated “clean” and the other “dirty”, in order to keep items separated as required. 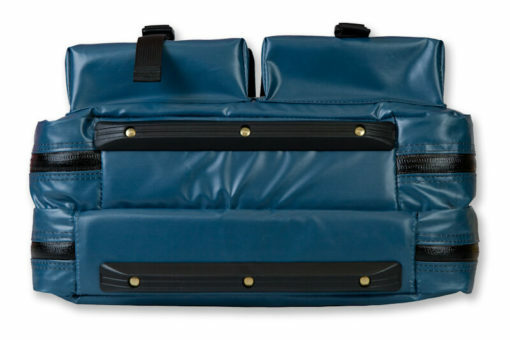 Comes with a removable padded shoulder strap. 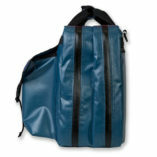 The fabric is 200 Denier PU (Poly Urethane) Medical Grade Thermo Laminated Nylon. This fabric is Waterproof fabric and it has been tested for leaks at 10psi for 5minutes. This is the same type of fabric that is used in life jackets and air bladders. Military Spec Nylon binding tape (3/4″) covers all raw edges. Military Spec CSB 69 Nylabond Thread. This thread is very heat and abrasion resistant. 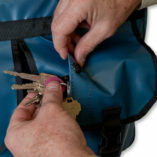 Handles are made from 1.5″ nylon webbing, not polypropylene. 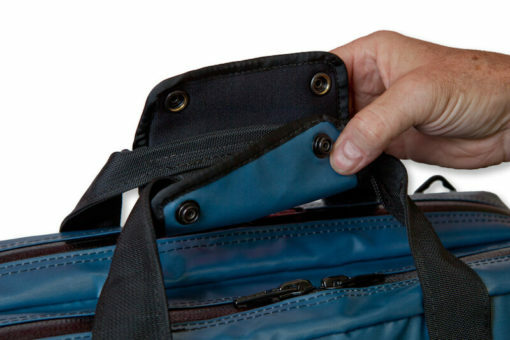 We use nylon webbing for our handles because it offers 20x the strength of polypropylene webbing. Nylon webbing handles are wrapped with a 1/8″ padded handle grip for holding the straps together as well as giving a little bit of relief to the hands. The bottom of the bag has large plastic feet screwed to purposely keep it off the floor. The feet are held in place with 6 screws so they can be taken off later if sewing repairs are required down the road. 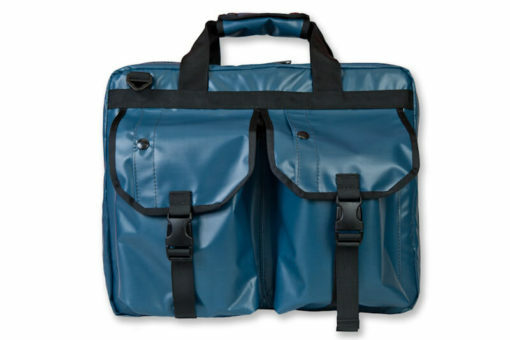 The bag is padded throughout with 1/4″ closed cell foam to give it some rigidity and also provide padding for instruments, vacutainers and delicate electronic devices. 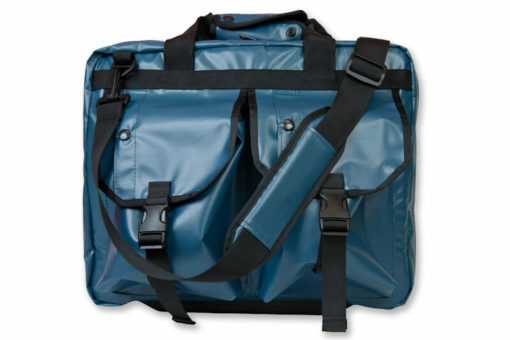 Adjustable, removable and padded shoulder strap. We have purposely kept velcro and elastic off the bag for cleaning purposes.